Trading Educators has three seasoned expert traders who are here to assist, manage, and simplify your trading. They understand their fellow traders and the obstacles they face in their trading growth. Let them show you powerful ways to maximize your trading potential. Trading Educators has received thousands of grateful comments from satisfied students and customers in more than 25 countries. They have an unsurpassed track record of success in trading and in teaching all levels (beginner, intermediate, and advanced) of traders. "Really like the Newsletter. Joe's Chart Scan is the only subscription I actually read in depth on a regular basis. Others are very quickly skimmed." "TN gives Ideas for new overall approaches to trade entries & trade management as well as ideas for individual trades. I like the way Andy explains his reasoning behind the trades he selects, gives me food for thought. The bite-size news stories are a handy heads-up for the fundamentals behind some of the market moves and Joes tips are always read and absorbed. Good to be able to chat with others in the same boat. To be able to direct any questions I have to Andy in real-time is a big benefit." "Hey Joe, after now 12 Years until I first read your Books “Futures-Trading “, “Trading is a Business” and “Day-Trading” and many Years of Studying the Markets Day in and Day out and read your Books Time and Time again, (There is allways something New to find!) i want to thank you in this E-Mail that you shown me how the Markets really work! After so many Years I´m now Consistent Profitable! And you and your Books are one of the Reasons! Time and Time again you give your “EDGE” to all the Traders out there. 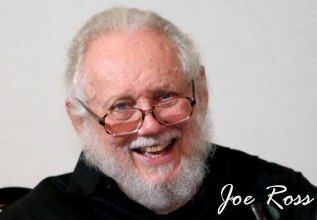 THANK YOU Joe… God bless you." "The Stopped out e-book is a Masterpiece, a book of great TECHNIQUES. My favorite topics - CCI, Volatility stop and ATR are great with in-depth explanation. Joe Ross is always my best author/tutor and his books are encyclopedia for my trading futures. Thank you for providing this book at this great age. Best wishes for a long life. JR trading books contains Great Wealth of knowledge with clear simple explanation, to the very point for trading. I am going to buy his "MONEY MASTER" and TRADING ORDER POWER STRATEGIES" next, why because the techniques shows are really happening in my trade. So, why do I purchase his books, they all contain real Trading Technics for trader's like me !!!!!" "The method looks like it is a great one! Is the first time during my 4 years trading experience that I actually made some money!! The only important issue is that it needs to be done everyday in my experience, or to put it better, the order needs to be there everyday, because missing an important big money trade in the month can make the difference with the Ambush; this is what happened to me, when i started putting the orders daily, my account began growing slowly!" "If I could turn the clock back to when I first started trading, I would begin private tutoring with Joe right from the start. His wisdom, knowledge of the markets and years of experience would have saved me from many years of struggle not to mention costly bad trades. I can already see the enormous benefits, not only financially but psychologically, by implementing his methods." "Andy cuts through the jargon and makes it simple to understand, straight to the points that matter and that will produce results. The whole program was done at a suitable pace and with no pressure. I have come out with a good knowledge of how to find and select trades. I feel far more confident in myself, and look forward to a potentially profitable future. Highly recommended." "Hi Joe, I can't say enough thanks. I just finished reading your whole book "Trading Is a Business" including the appendices. I'm so glad you included them too. What a gift you given us and challenge. Your book is doing such a wonderful job of challenging and encouraging me to be the best I can be. Do the work and love the process. Truly for me, trading is the best business in the whole world for me now. All my best, Richard"
"About the Trading with MORE Special Setups webinar: Very well-framed conceptual introduction. The recommended approaches are generally effective in my experience (I had previously arrived at my own variation on Gimme). The real-world trading examples where JR presents scenarios and asks what you would do are OUTSTANDING. JR's presentation conveys authority, and is often quite amusing." "As an option seller, I've found this book to be very informative and essential for the way I prefer to trade. From personal experience, this book compliments Trading Optures and Futions. That said I think it's essential that Trading by the book and Trading Optures and Futions should be purchased together." "The Traders Trick webinar is brilliant. Extremely helpful and immediately applicable. All was extremely clear. Previous webinars and Joe's experience and presentation style have convinced me to attend this one as well."